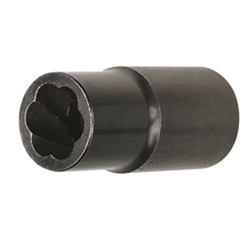 Lug Nut Removal Dual Sided Twist Socket 31inc 14-840 / BOWES TT 37840.For the removal of lug nuts that are damaged/rounded because of unsuccessful removal, rust or other damage. The twist socket has a fluted design which gives the socket a tight grip to remove the most difficult lug nuts with easy removal of the lug nut from the socket. Works with a 1/2" impact gun or breaker bar for service calls.